The tooling is offered with quick-change features. Therefore, easy specification changes can be performed within several minutes including program change. The wire clamp mechanism ejects the scrap wire as the wire clamp is released. Due to this, wire scrap will not interfere with the winding process. A preventive device can remove vibration from the center former (option). By reducing the number of total part, the machine has an overall simple construction and compact total machine footprint. With the tool transfer feature of the KIO, an automatic free flow system can be added. 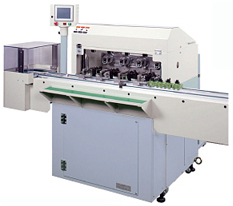 So small lot production can be automated for a highly efficient manufacturing process. Winding is performed on the core directly by the ‘nozzle arc motion' of the nozzle flyer. This stabilizes the tension and makes layer winding possible. Each unit is standardized for easy replacement. Flexible system construction can be provided, such as automated multi-spec small-lot production and operator-less production.